If your computer is running slow there are many things that could be causing it - often it's when there are too many programs running at the same time. We can upgrade the RAM, or often just a service will restore it's former glory. How Safe Are You When Online? Not having adequate security when you are on the internet, is like not locking the doors when you leave the house. 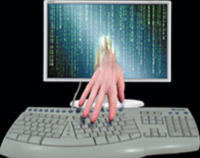 It is paramount to secure your PC in the best way possible to avoid Identity theft and credit card fraud. We can call to install an Anti-Virus program which checks for Spyware, Virus', randsomware and all sorts of digital nastyness thats on the web these days.